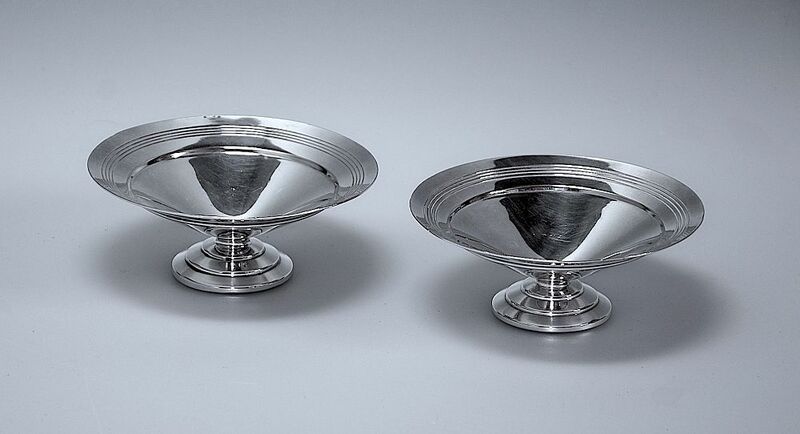 This fabulous pair of dishes are by Keith Murray for Mappin & Webb and were made in the 1930s. Each dish is designed as a miniature footed tazza. The round three tiered foot supports a shall concave top that has the typical 4 incised rings running round the outer raised edge. The base of one is marked 'Mappin & Webb Prince's Plate 418 W27702 Rd.772183" with an "R" in a shield shaped cartouche. The base of the other is marked "X Mappin & Webb Ltd W27702 R.312"